Date Night spends a fun weekend in Blue Ridge, Georgia and eats a lot of good food. 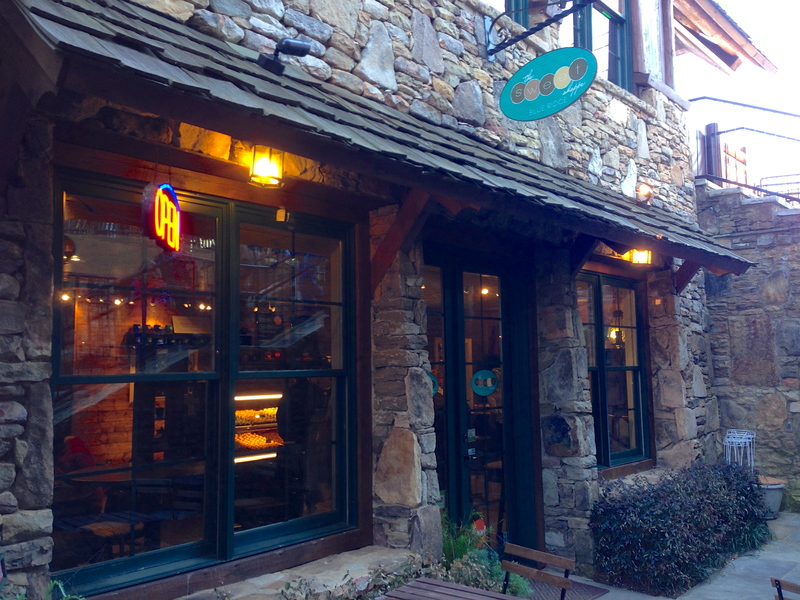 Come with us as we take you on a culinary tour of the hits and misses in this part of the north Georgia mountains. For our review of Harvest on Main, click here. Due to a “propane shortage” at the house we are staying in, we drive into town for breakfast while waiting for the heat to come back on. 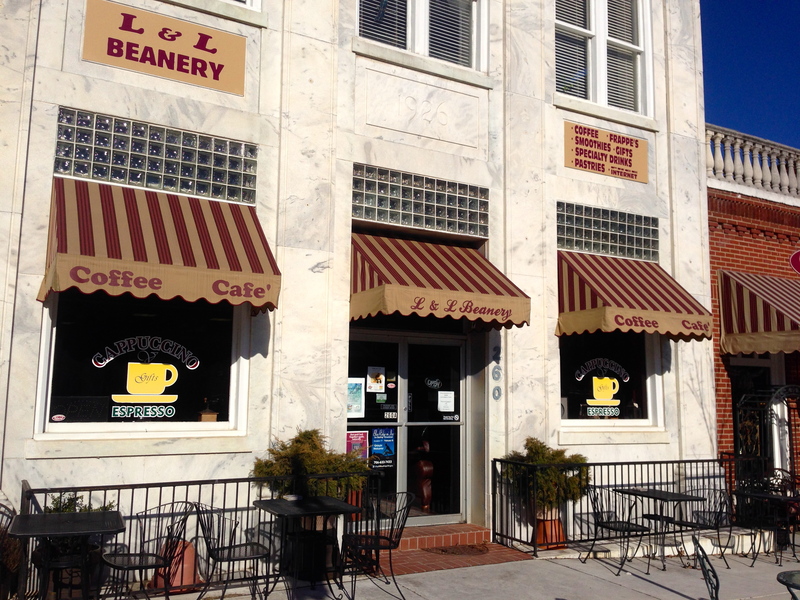 L & L used to be the bank. The vault is still there. 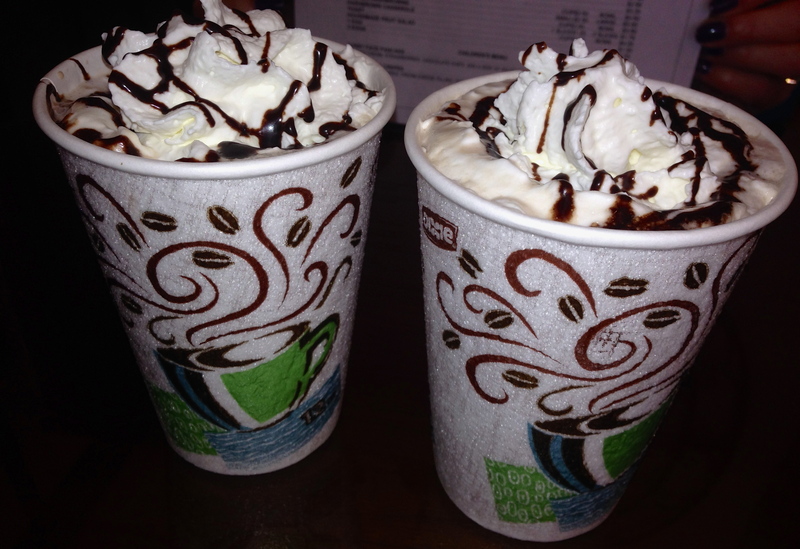 It’s cold and we aren’t coffee drinkers, but we do like hot chocolate. It’s hot, it’s full of chocolate, and it’s topped with whipped cream. Life is good. 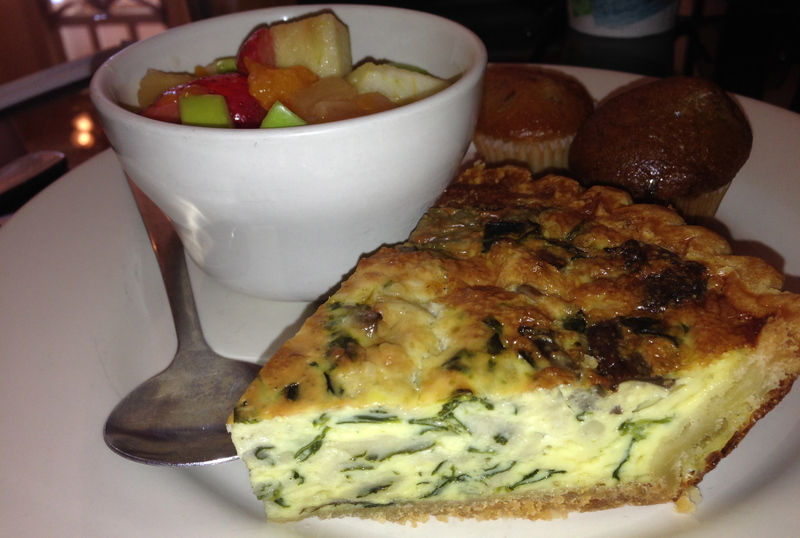 Eve gets the spinach and onion quiche. It comes with fruit and two muffins for less than $6. A price performer! 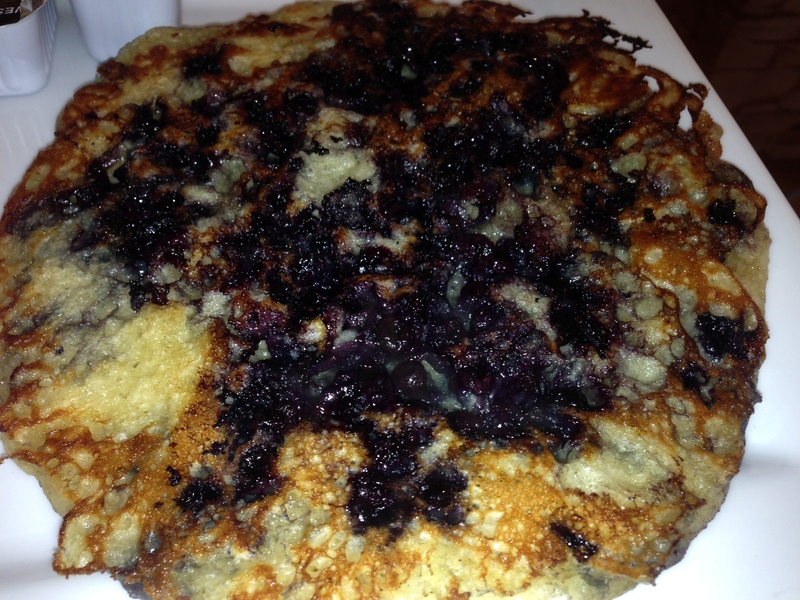 The jumbo blueberry pancake looks like a giant blob of blueberries. I enjoy the generous helping of blueberries inside of the nicely-cooked pancake. If you ever read Grant Goggins’ excellent barbecue blog on Marie Let’s Eat, you will notice that Grant has visited almost every BBQ place in Georgia. We surprisingly find some BBQ that Grant has not tried, and he needs to plan a trip here. Owner Joe Ray used to be an investment banker. Now he’s cashing in on the BBQ business. He’s a constant presence in his restaurant, which is the top-rated place in Blue Ridge on Trip Advisor. 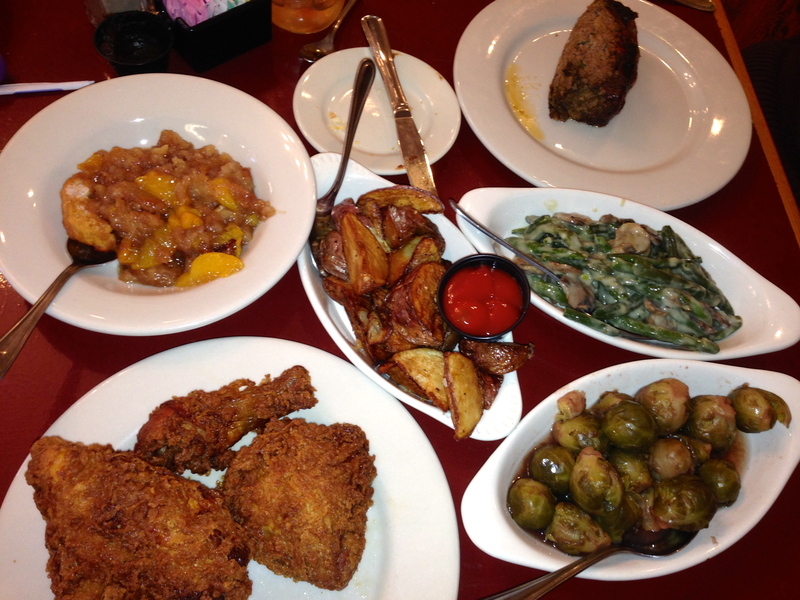 We order the combo platter so we can taste a little of everything. It arrives with chicken, pork and three baby back ribs. Due to a “supplier mixup”, they don’t have their normal ribs today, which is disappointing. The baby backs are good, but we prefer the meaty, fatty ribs you get at most BBQ joints. The pork is amazing. Not too smoky and very moist. There are five sauces to try. We like the mild the best. The chicken is drier than the pork. It must be hard to keep it moist in the smoker. 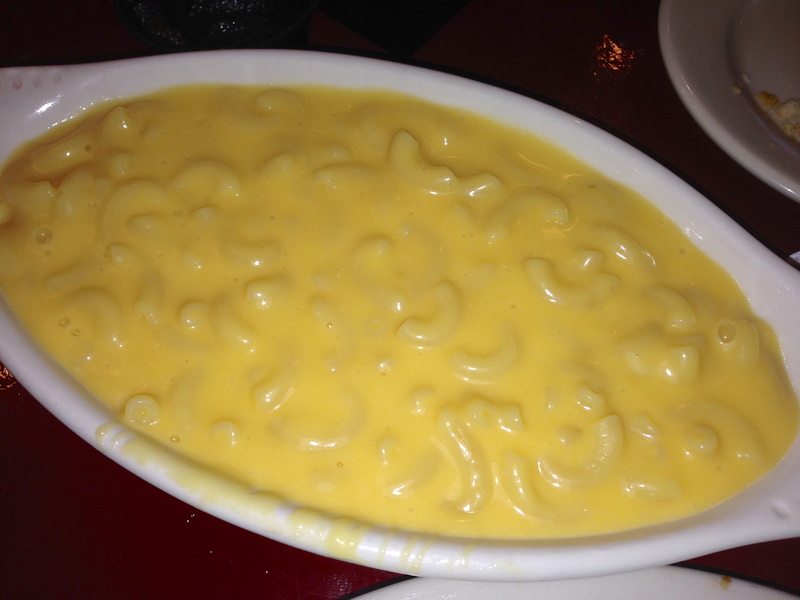 The macaroni and cheese is very good and has a lot of love in it. 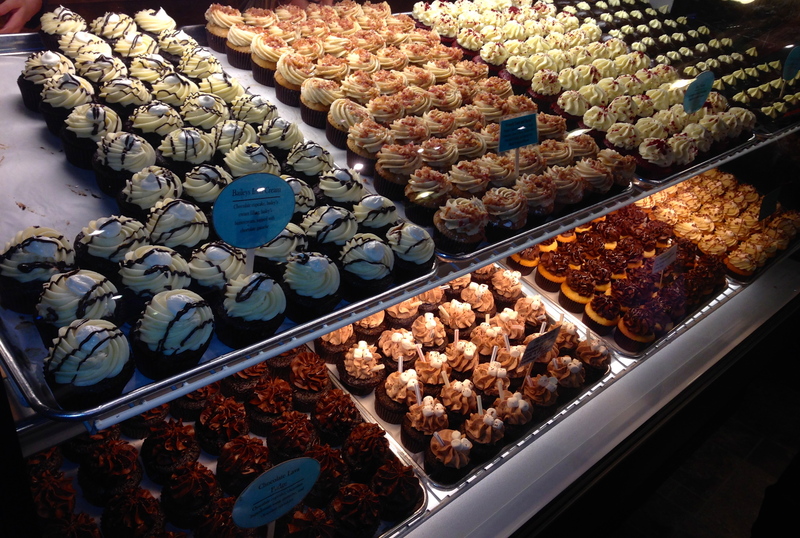 We can see why Joe’s is #1 in this area. Need something sweet after all of that barbecue? Walk down the hill to The Sweet Shoppe. Rumor has it these folks won “Cupcake Wars”. You can imagine what sells the best. Rebels that we are, we go for something different. 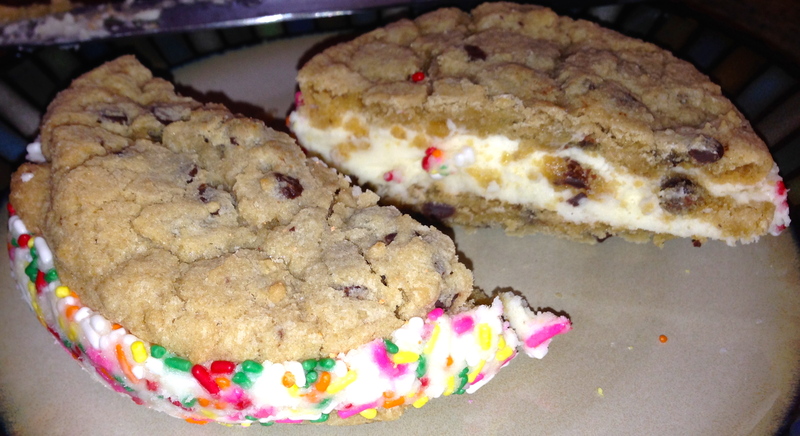 The cookie sandwich features two chocolate chip cookies with lots of that yummy butter cream cupcake icing between them. Anything with sprinkles on it has to be good. It’s sweet and decadent. We cut it into quarters and share at two different meals. 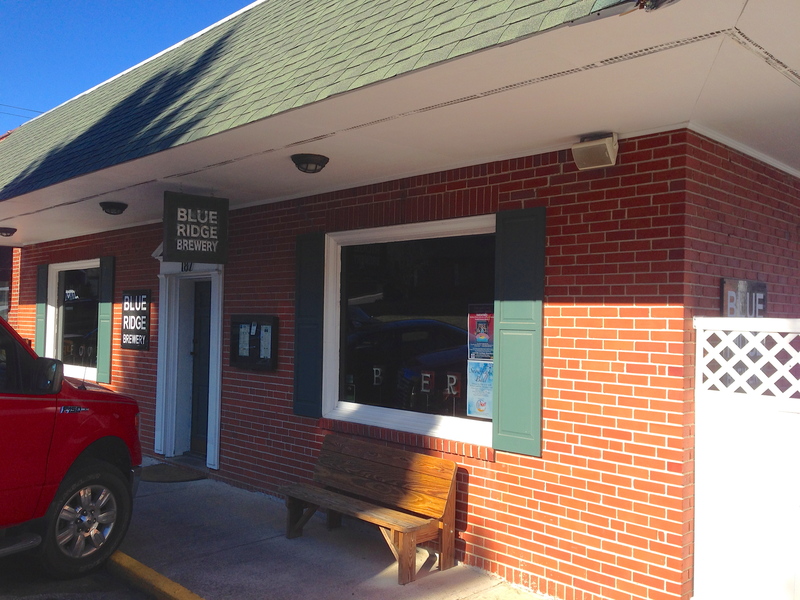 Blue Ridge Brewery, 187 Depot St. If there’s a brewery in town, you can usually find Date Night there. The Blue Ridge Brewery makes about twelve of their own beers. They have about five on tap tonight, none of them the darker beers that people like to drink in cold weather. Like all good brewpubs, you can get tastes. 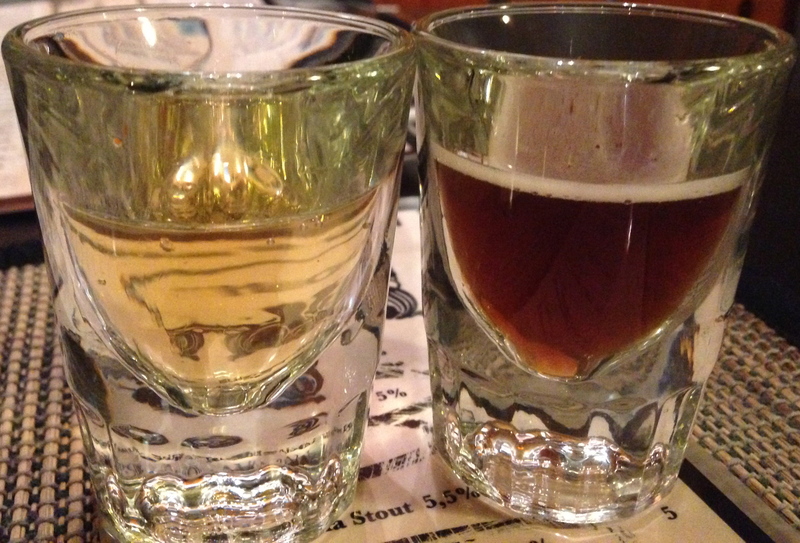 We try two, a kolsch (on the right) and some kind of hybrid beer-wine concoction. Neither beer is good. We try two more, an IPA and a lager. The IPA is just OK, and the lager has no taste. Fortunately, there are about ten beers from good breweries on tap. For some reason, these don’t appear on any menu, and our server has to recite them to us. I don’t think she got all ten. 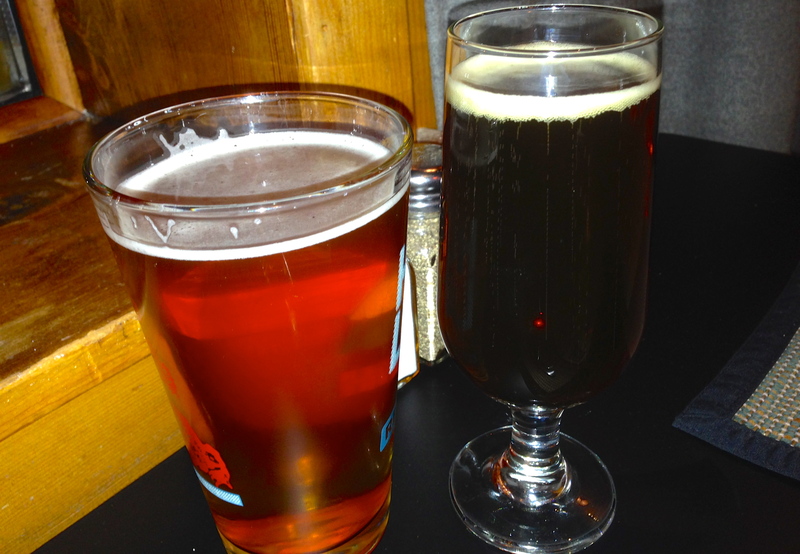 I get a Duck Head Scotch Ale (the dark one) and Eve, feeling like she needs to drink a beer made here, gets the kolsch. There is some good news here. The burgers are excellent. For $8,the veggie burger comes with cheese and spicy guacamole. 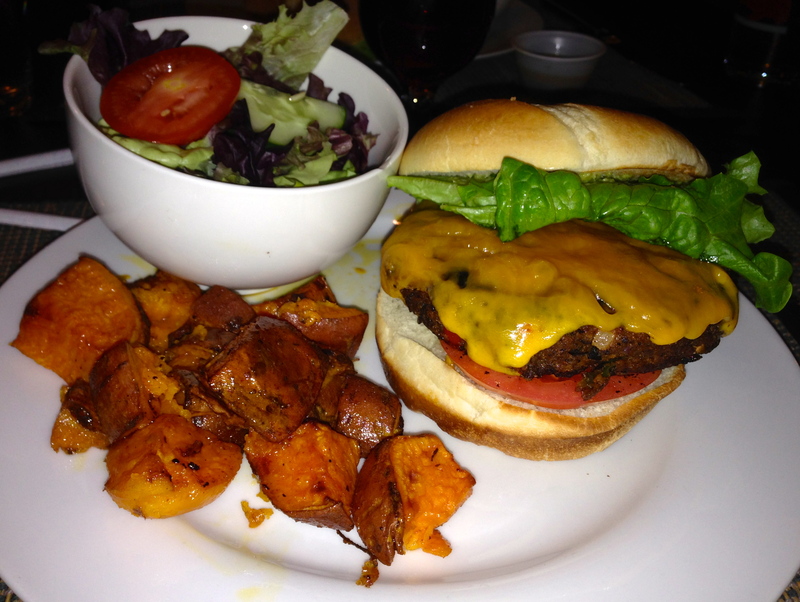 The burger itself has a kick, and paired with the spicy sweet potatoes, it sets my taste buds afire. Good thing I have a decent beer to put out the flames. The verdict: skip the house-brewed beer and go for something regional. 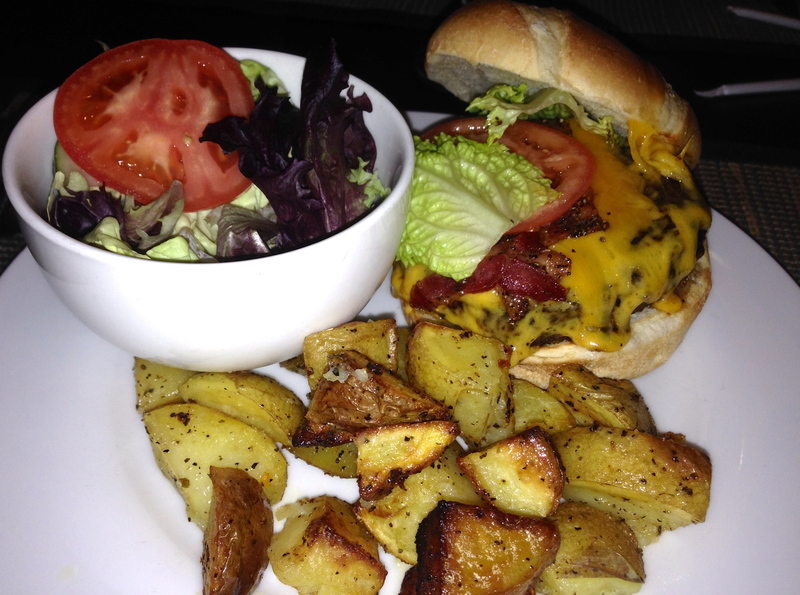 Embrace the burgers–they are great. We have time for one more meal before heading back to Atlanta. 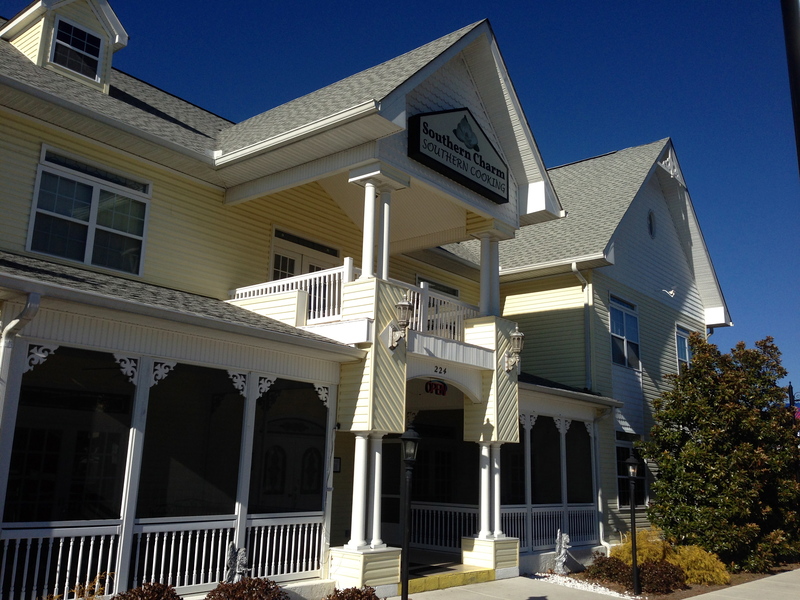 Many restaurants are closed on Sundays in Blue Ridge, but Southern Charm is open for lunch. On Sundays, you order a main course and they serve family-style sides. Think meat and three on steroids. 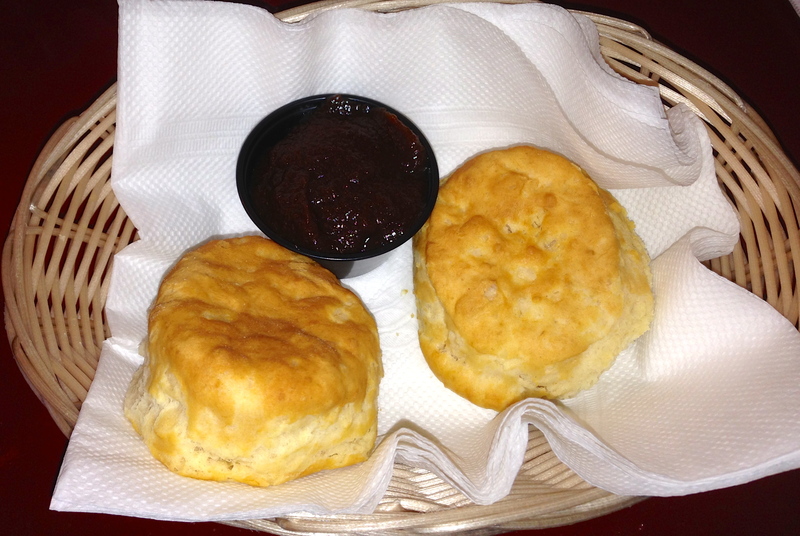 We are greeted by a friendly server and two biscuits with apple butter. We want to try two different meals, and we order the fried chicken and the meat loaf. A few minutes later, a huge tray of food comes out. Today’s sides are potatoes, green beans, and Brussels sprouts. The sprouts are boiled in a sugary water instead of baked, which gives them an interesting flavor. The chicken is crispy on the outside and moist on the inside. There’s three large pieces of chicken and a massive chunk of meat loaf. Also along for the ride is macaroni and cheese. This is not very good, probably because it comes from a box. 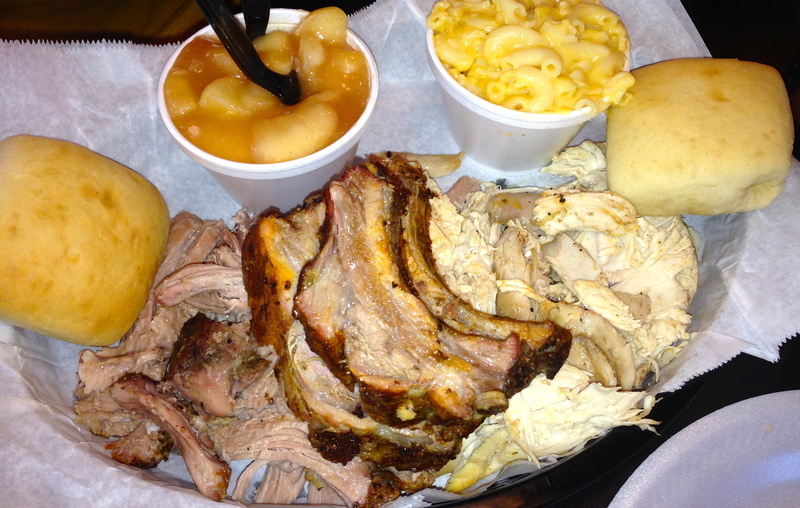 Stick to the mac and cheese at Joe’s BBQ. If that’s not enough, the dessert and your drink is included. 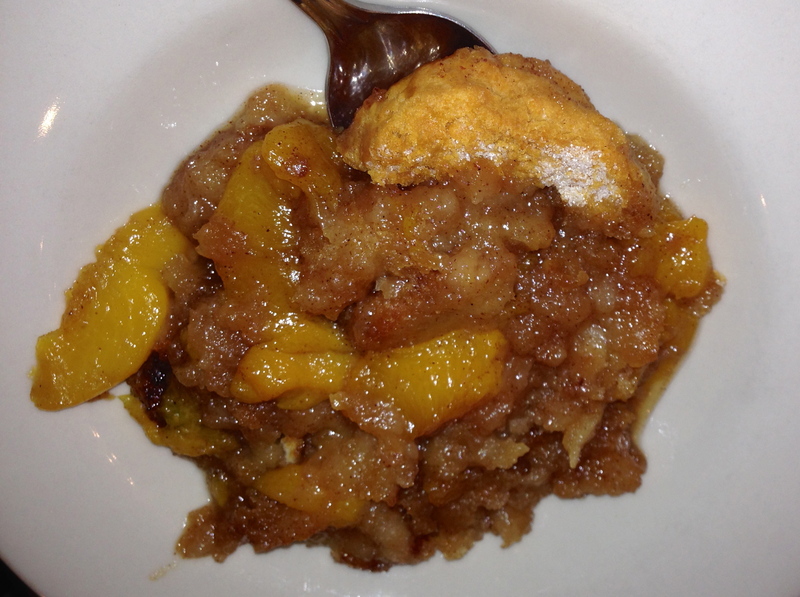 The peach cobbler has some nice crispy cobbler parts and a sweet cinnamon flavor. All of this food costs under $25. As you can imagine, a lot of it goes home with us, a souvenir for lunch the next day. Awesome! We were actually headed for Joe’s in November 2012 but ended up at Pink Pig that trip instead. There are at least two others in that area as well that we’ve not tried yet. Maybe in a few months we’ll make another trip that way! 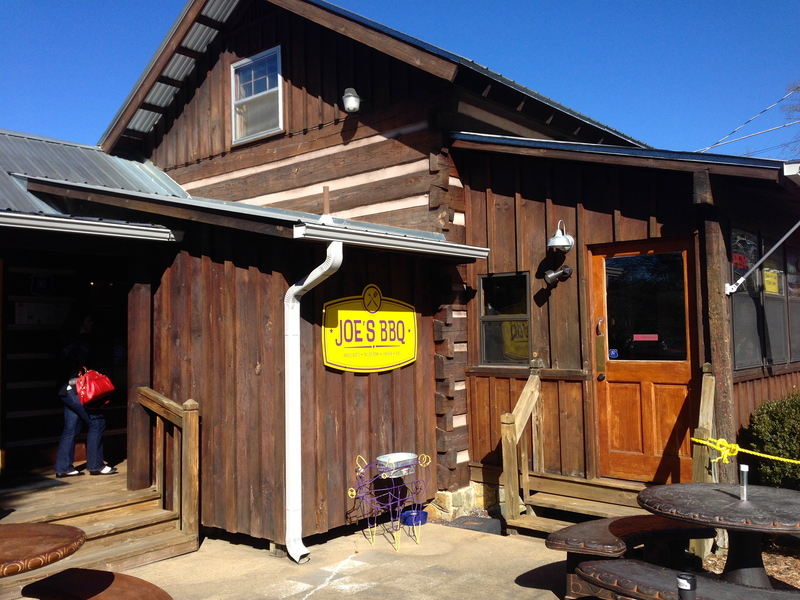 Joe’s BBQ, Blue Ridge GA – Marie, Let's Eat!